Our new blog contributor, Danielle Dirks, wrote her inaugural post for us about the SPLC’s report on the rise in hate groups, which other bloggers have noted as well. I wanted to say just a bit more about one aspect of that story, the presence of racism and white supremacy online in the Obama era. I’ve referred to this here and elsewhere as cyber racism. As you can see, there’s a significant uptick in traffic to Stormfront around the time of the election and then again a few weeks after that. However, web traffic to the site seems to be falling off more recently (I’d predict a slight uptick following all this coverage). Alexa’s traffic rankings are based on the usage patterns of Alexa Toolbar users and data collected from other, diverse sources over a rolling 3 month period. We correct for potential biases in the data collected from our Alexa Toolbar to better represent those types of site visitors who might not use an Alexa Toolbar. As you can see from these two charts generated by Big Boards (not Stormfront), the trend in traffic is clearly upward over time. Furthermore, the statistics for registered users for Stormfront according to Big Boards is: 160,516. When my book went to press a couple of months ago, I’d listed the number of registered users as Stormfront as “over 124,000” and in the CNN report, Don Black actually underestimates the number of members as “110,000.” So, there does seem to be evidence to support the idea that the election of President Obama has spurred an increase in traffic to these sites. The key idea to keep in mind here is not that the Internet is luring people into white supremacy online, it’s that people are seeking out these kinds of ideas in response to our first African American president. This list was compiled using hate group publications and websites, citizen and law enforcement reports, field sources and news reports. Hate group activities can include criminal acts, marches, rallies, speeches, meetings, leafleting or publishing. Websites appearing to be merely the work of a single individual, rather than the publication of a group, are not included in this list. While this is maddeningly little detail by sociological standards, what this snippet does suggest is that we should be cautious about conflating “registered users” and “social movement membership.” In other words, just because someone is a frequent visitor to a racist website doesn’t necessarily mean that they’re members of the white supremacist social movement. But then, that’s a post for another time. Danielle and Jessie, thanks for the sharp insights and data. Jessie, what do the alexa-type trends show for other large supremacist websites? Thanks, Joe ~ good question. Stormfront is far and away the leader among online venues for white supremacy. If you go to Alexa.com and type in Stormfront.org, and then several other WS sites (e.g., National Alliance [natvan.com], Resistance.com, Resist.com, and DavidDuke.com), you can see a comparison of these sites. Stormfront leads these other sites by several orders of magnitude. 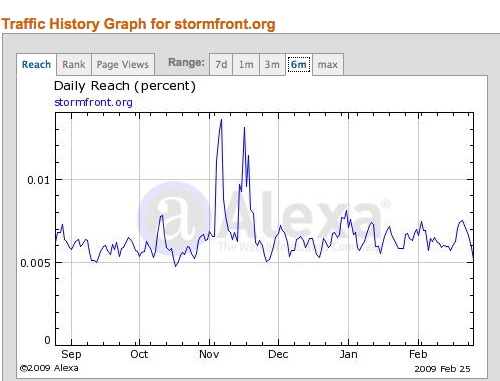 That said, the pattern of highs and lows at the other sites closely follows the traffic pattern at Stormfront.